Generally, if you are using Interlok as an HTTP endpoint, then you would just use one of the standard HTTP consumers as part of a normal workflow (Servicing HTTP requests); however, in certain situations it can be useful to expose an arbitrary workflow (e.g. a JMS bridge) so that you can inject messages into the workflow without doing additional configuration. This requires that you enable the built-in jetty instance, and the new “rest” management component. With a factory installation of Interlok, the embedded web server should already be enabled by default. This can be checked in the bootstrap.properties for the “managementComponents” property. As shown above “jetty”, the embedded web server is enabled along with the “rest” component. The final line above shows the restful services component has completed it’s initialization, you’re now ready to fire your requests. There is a single http GET API endpoint that will return an OpenApi 3.0.1 API definition. description: A REST entry point into your Interlok workflows. description: Post your message directly into your Interlok workflow. description: The response content after your workflow has processed the incoming message. By pointing an OpenApi 3.0.1 tool to the definition url you can visualize the full API available for this instance of Interlok. 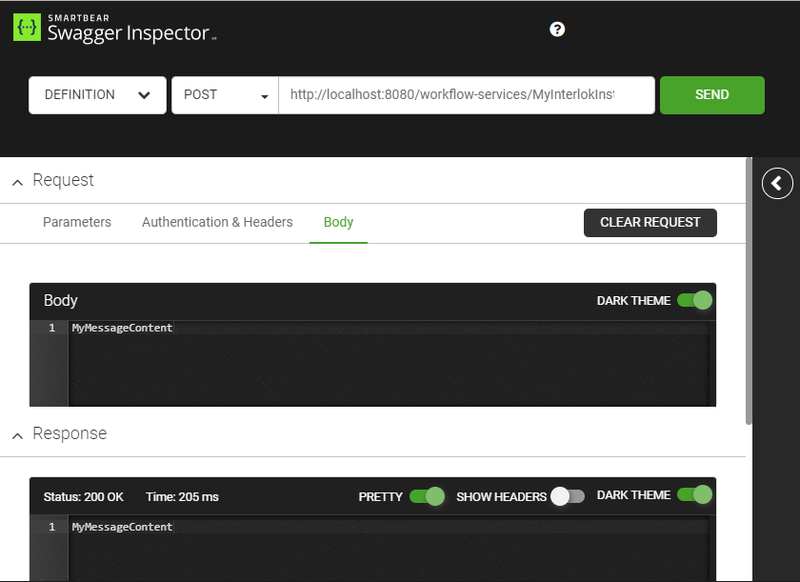 Swagger, interprets the API definition and provides instant access to each workflow, via a http POST. The Interlok message content will be drawn from the body of your POST request. Any http headers will be converted into Interlok message metadata. 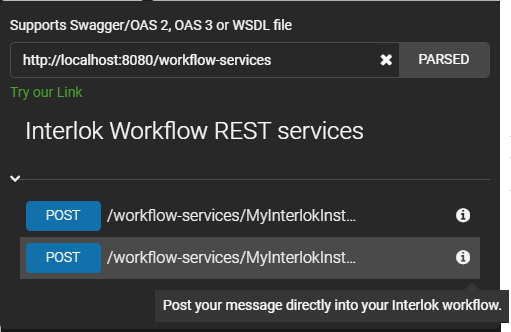 If your message was successfully submitted to the workflow then you will get a http status 200 code response with the updated content as the body of the response. Should your request fail or cause an error, you will receive a http status 400 code along with details of the error in the body of the response.